As one of the biggest manufacturers in china, we now export our coffee tamper to almost 15 countries and get a good feedback on the quality. Our material is 304 food grade stainless steel, 6061 Aluminum etc. 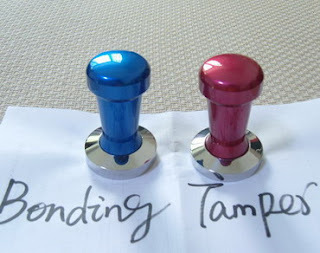 More informations about our tamper please virst www.coffee-tamper-china.com, the listed tampers on our website just the sample of our volume-produced products, we welcome customized designs if you have your own drawings or need your own colours. Welcome everyone to come here, Bonding Cnc Parts Co.,Ltd. is a leading manufacturer of coffee tamper as well as some other coffee parts in China. Although the main business of our shop floor is supplied all kinds of cnc parts to chinese factory, but we had been exported coffee tampers 5 years. Till now, we didn't get any feedback on our defective parts, for we control strictly on quality inspection. To know more informations about our company, please virst our website.